Friday morning we were up bright and early. Actually, let me back up a bit. I realize that I'm doing what I always do when I have A Big Story, and that's to drag it out for as long as possible to the point that nobody remembers when or why we started. So let me provide you with a refresher timeline. In addition to paying our respects to the Kennedys, we were able to watch a changing of the guard ceremony at the Tomb of the Unknowns. Now, I'd been to Arlington three years ago, but this time the visit seemed more...solemn. Not that I did cartwheels between headstones the first time, but Noah hadn't even begun Academy yet. Now, he's been a patrolman for almost three years and we're moments away from becoming a military reserve family (more on that soon). With just a little bit of research into our contemporary armed forces, being among thousands who gave their lives—either through the immediate sacrifice of war or the long-term sacrifice of service—was humbling. 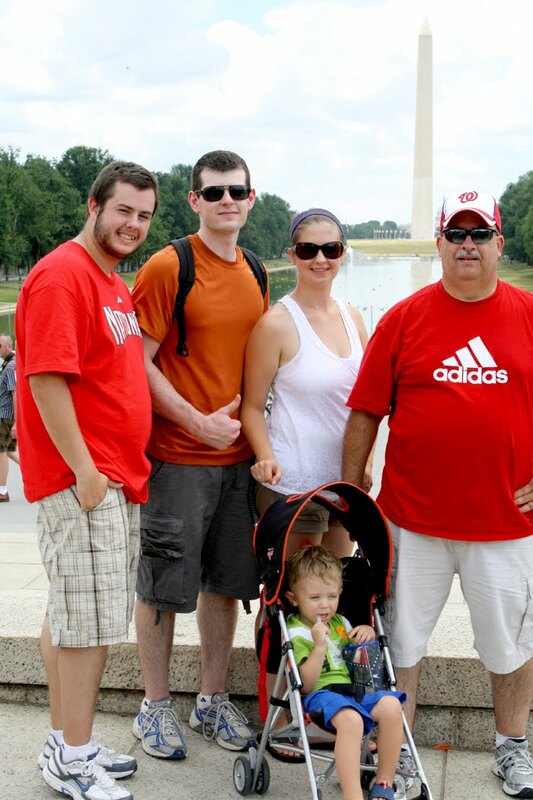 After the changing of the guard, we headed to the National Mall. 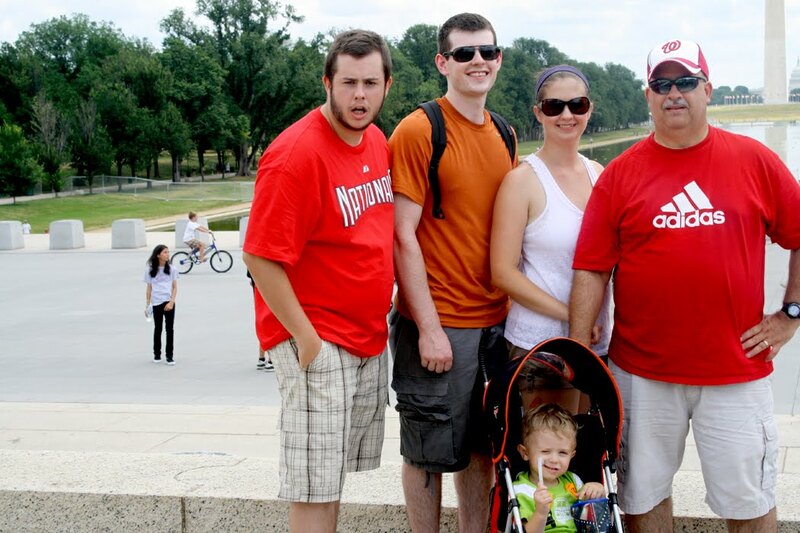 We braved the throngs at the Lincoln Memorial and took photos of Kyle and Noah being nerds on the steps. Kyle being a nerd. Also, Mom being a nerd by totally misaligning the shot. We observed the Washington Monument at the other end of the Reflecting Pool; I had to convince Ethan that unfortunately he could not go swimming in this particular "pool wallo." Although truth be told, I wouldn't have minded a quick dip to stave off impending heat stroke. In the end it took a bribe of ice cream to get him to drop the issue. Dad was able to visit the Korean War Memorial which, aside from being haunting with its numerous statues of soldiers walking through juniper bushes, was poignant since my Papa is a Korean War Veteran. 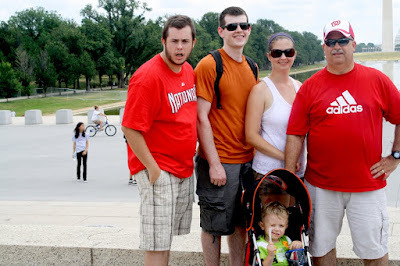 I've put together a quick slideshow of some Arlington and National Mall photos (all taken by my Dad), that I hope captures the poignancy of that morning. Of note: The two photos of the Sergeant saluting (at the beginning and end of the Tomb of the Unknowns photos) are not repeats; his movements were so precise that the difference between the two salutes is almost indistinguishable. Our last stop was the American History Museum, possibly my favorite destination in D.C. The only thing better than being inches from Michelle Obama's inaugural gown was being inches from the enormous remnant of the flag that inspired the national anthem. Call me a geek, but my souvenir was parchment replicas of the Bill of Rights, the Constitution, the Declaration of Independence, and the Emancipation Proclamation. Ethan's souvenir was a stuffed beagle named Nosey. 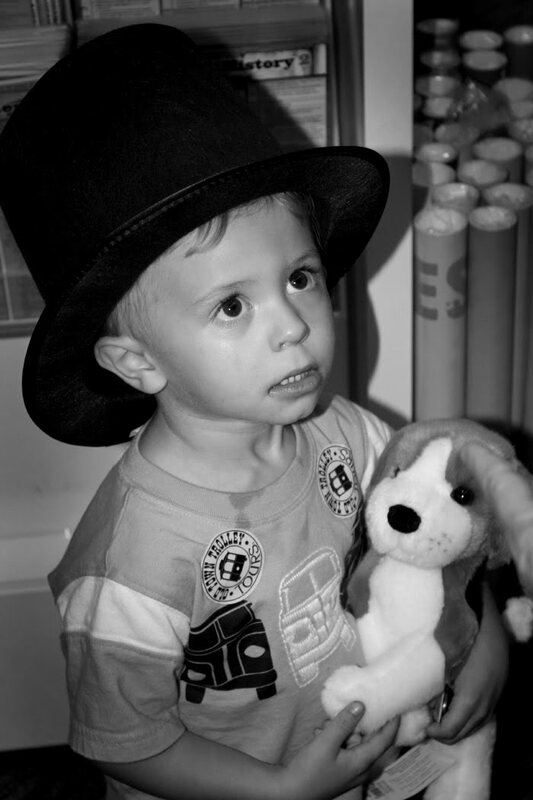 The Honest Abe stovepipe hat was merely a photo prop. In our original plans, Nanny would be joining us on the second day in Our Nation's Capital, but with the ungodly heat and her propensity for wearing a cardi in all climates, it would have been disastrous if not dangerous to bring her along. I was sad that she wouldn't get to see the monuments, but we decided to take her to Baltimore's Inner Harbor for the evening. We dined at the very same pub in which I wept through lunch the last time I was in Baltimore. I had forgotten, or perhaps didn't realize, how incredibly delicious the food was. We all heartily enjoyed our meals from a balcony overlooking the water, then wandered around for awhile. Ethan and Noah rode a dodgy-looking carousel while Nanny insisted Kyle was steering her wheelchair dangerously close to the water (he wasn't). Then we bought an embarrassing amount of dessert from the Cheesecake Factory to enjoy back at the hotel. I couldn't forget Ethan's entreaties for "pool wallo," so we finished off the day in the Sleep Inn–Laurel's disconcertingly foggy pool, where I remembered, while watching Ethan joyfully splash around, why Kyle and I considered our childhood family vacations to the Palm Springs Ramada Inn to be heaven on Earth. While Ethan and Poppy paddled around, I led Noah and Kyle in a synchronized routine of running in place, Shamu splashes, and Mom Swimming (you know that stroke: it's when your mom would frog around with her head above water so as not to wet her hair). I even gave Noah and Kyle a few swimming tips I learned while training for my sprint tri, the main one being A Proper Flutter Kick Doesn't Include Splashing Your Feet Like An Idiot. You're reminding me how much I love D.C. 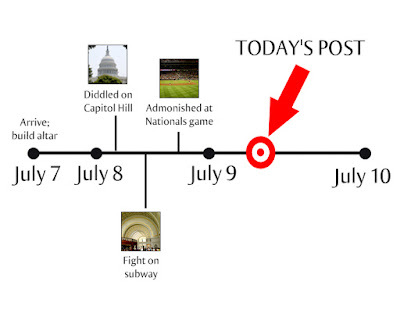 The monuments, the American history, Michelle Obama's inaugural gown. It's actually a big deal you got to see the flag. It being restored for a long time and is finally back. Glad Nanny wasn't pushed into the water! Glad you all survived the heat--that can be brutal with a little one. Driving in DC causes me to go bonkers. I just never can seen to get my bearings there. I am so enjoying your DC adventure. This has to be the hottest time of year and you have to be melting! I love Washington DC! Erin! You continue to serve as a role model -- look at you all multimedia blogging with stunning info graphics, slide shows with music, and whatnot. You kids, what will you think of next? Hey, I think on your first shot in front of the reflection pool, your mom just wanted to get that brunette chick grabbing her crotch.